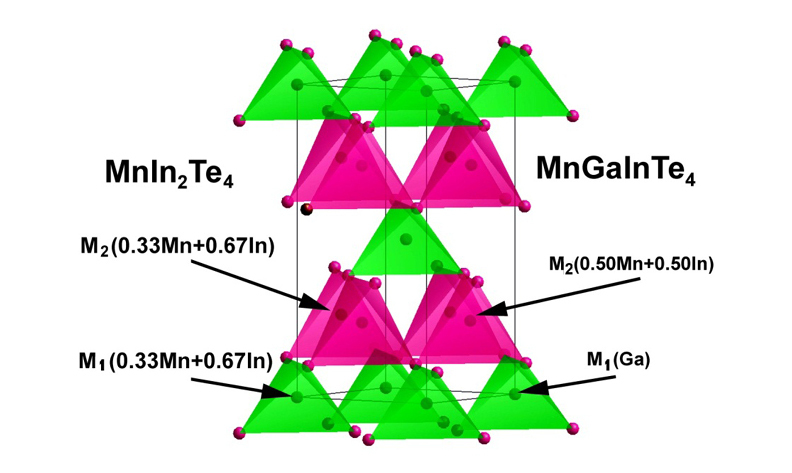 The phase equilibria in the MnGa2Tе4-MnIn2Tе4 system were experimentally investigated by means of differential thermal analysis and powder X-ray diffraction technique. It was found that this system is quasi-binary and characterized by dystectic and eutectic equilibria and the formation of a wide area of solid solutions based on the starting compounds. The crystal structures of the MnGaInTe4 and MnIn2Tе4 were refined by the Rietveld method using powder X-ray diffraction data. It was established, that both phases crystallize in the tetragonal system (Space group I-42m). Electron paramagnetic resonance and Raman spectra, as well as the temperature dependences of the electrical conductivity and the Hall effect for the MnGaInTe4 crystal, were studied.